Our shoemakers will give new life to all your leather goods. Whether it’s a pair of shoes, a pair of boots, a purse, a coat or anything else, we are able to repair them. Combining decades of experience in the business, our shoemakers will satisfy you. 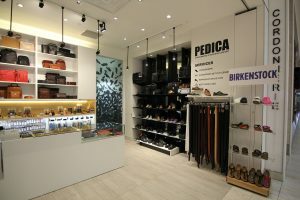 Cordonnerie Pedica is a family business where the customer comes first, and it has stood the test of time because of its unique customer service and production of high quality goods. We are located in Galeries d’Anjou, and easily accessible so you are free to walk in anytime for your foot wear or accessory needs. We deal majorly in orthopedic correction, clothing alterations footwear repair, and custom made items. With more concentration on orthopedic shoes for about 25 years now to enable our customers walk and work in comfort.